The Margate biscuit is Tasmania’s salute to the Kingston biscuit, according to pastry chefs Alistair Wise and Teena Kearney-Wise. Like the Kingston, it consists of two coconut biscuits sandwiched around a chocolate centre. 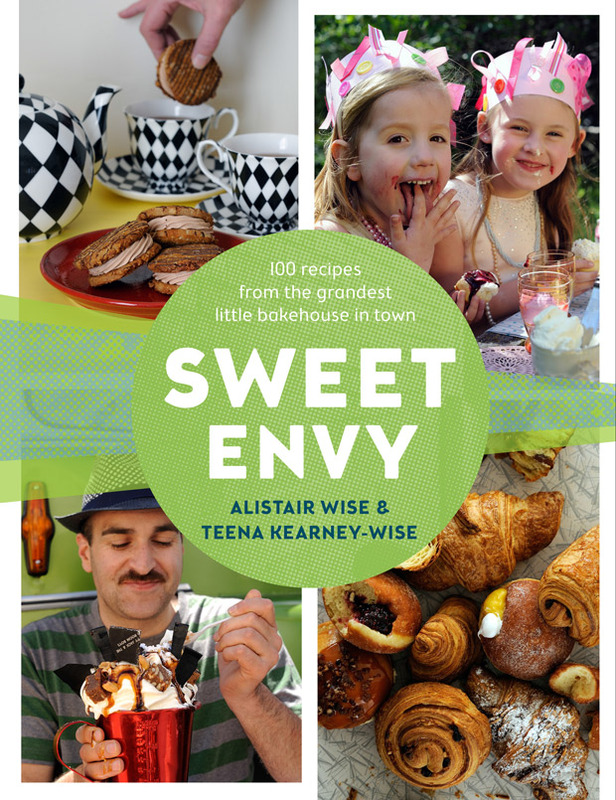 “Our version is slightly better; that’s why it was given the name Margate,” the couple write in the introduction to the recipe in their new cookbook Sweet Envy, published this week. Anecdotes are shared throughout the book, which features 100 sweet and savoury recipes from the husband and wife team’s cake shop and bakehouse in North Hobart. Preheat the oven to 180C (350C/Gas 4). In a large saucepan, gently melt the butter and golden syrup, then add the sugar, coconut, rolled oats and vanilla. Dissolve the bicarbonate of soda in 2 tablespoons of boiling water, then add to the butter mixture. Add the sifted flour and salt and mix well. Roll into 24 small balls and place on the baking trays, allowing room for the biscuits to spread and flatten during cooking. Bake for 10–15 minutes, or until golden and cooked through. Remove from the oven and cool on the trays. To make the ganache, put the chocolate in a heatproof bowl. Bring the cream to the boil in a small saucepan and pour over the chocolate. Leave to melt for 2 minutes, before mixing to a smooth, shiny ganache. Add 150g (5 ½ oz) of the ganache to the frosting, to make a chocolate frosting. To assemble the biscuits, pipe a ring of chocolate frosting around the edge of half the biscuits. Place a spoonful of ganache in the centre and pop a lid on top. The biscuits will keep in an airtight container in a cool dark place for up to 1 week. Razzle dazzle: You could add some salty caramel to the frosting, or a nip of liqueur, such as amaretto or Grand Marnier.